Most SF readers, however unfamiliar with Czech SF, will be aware of Karel Čapek, the grandfather of Czech SF. According to Darko Suvin, Čapek wrote “to deal with ‘great social interests and collective spiritual problems’ arising out of ‘the leading ideas of science, guesses about the future, feats of technology’—that is, to deal with the destructive menaces which the irruption of modern mass production brings to the little man.” [In “Karel Čapek, or the Aliens Amongst Us." Metamorphoses of Science Fiction (1977) p. 271.] So how do contemporary Czech writers deal with complex issues of race, conflict, discrimination, or inequality, the “great social interests and collective spiritual problems” of the present? 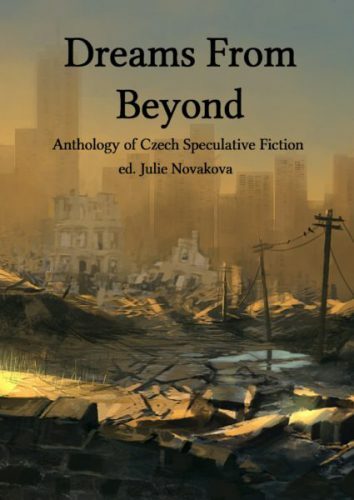 In what ways is Czech SF different from American SF—or SF published in American magazines? These are some of the questions that interest me—but that can’t be answered in depth through a thin sampler of less than two hundred pages. That said, Dreams From Beyond is a timely anthology (available for free download), composed of reprints, extracts, and translations—some of which are fascinating, others quite remarkable. Jan Kotouč ‘s “War Games,” Jaroslav Mostecký’s “Axes on Viola,” and Julie Novakova’s “The Symphony of Ice and Dust,” in particular stood out for me for many reasons reminiscent of Čapek's work. In Jan Kotouč’s “War Games,” ordinary civilians risk being taken away to be pawn soldiers in a war against those fighting the Pax Civitas—the greatest city in the world. The city is shining and growing, continuously annexing new lands and territories, under something like a military rule. These civilian soldiers are operated upon and fitted with implants all over the body and the brain, and controlled by trained combat terminal officers. The cruel and inhuman treatment of these soldiers makes them no different from Čapek’s robots in R.U.R. or the salamanders in War With the Newts. Readers familiar with this type of military SF can tell we’re about to witness a rebellion. Jaroslav Mostecký’s “Axes on Viola” is a fantastic adventure tale set in a distant world. The protagonist finds himself on the run after discovering the reason—a hidden source of wealth—for the disappearance of certain workers, who were sent to harvest Viola’s natural resources. By chance, and through the simple act of observation, the protagonist finds a way to retrieve pearl-like gems without getting killed. The trick to tame or deceive Viola’s poisonous shells is a very simple one—something that we saw the blue-eyed Czech Captain J. van Toch employ to tame his Newts (in War With the Newts) as well. Van Toch's adventurous spirit can also be found in Mostecký’s protagonist. The alien setting of the world is distinct and memorable. Told through first person, the story packs a lot of fun, mystery, and excitement—even though (or perhaps because) we know what to expect from such tales. Julie Novakova’s “The Symphony of Ice and Dust” (previously published in Clarkesworld) is a post-human space opera with a tragic love story at its heart. The worldbuilding is familiar—the loneliness of spacers, the inherent difficulties and uncertainties of space travel, and the chance discovery of alien artifacts are themes common enough in the genre. Novakova relies upon the readers’ familiarity with and expectations of the genre to deliver a quiet and beautiful tale. Her protagonists are explorers who travel to faraway worlds in time and space to find and create music for a more advanced civilization. The story ends with a grand tribute of sorts to the memory of the lost humanity, early human civilization. This brings us to the most important question tackled in the best of science fiction and fantasy: what is humanity if not its essence imagined, negotiated, and passed through and in our arts—music, poetry, stories, films—and technology? Pavel Renčín’s “The Dragon Star” is a lament about the loss of a part of our humanity—our ancient heritage—its old tales and mythic creatures. There’s a legend that says every mythical creature is invisibly bound to some star. Whenever a myth is forgotten by mankind, a star flames out in deep space. Again in the tradition of Čapek, among several others, Petra Slováková’s "The Real One" explores the nature of humanity through artificial beings. When real family members age, or die, or are simply not smart, educated, or good enough to help advance people’s social or career prospects, they get androids made with the desired looks, social etiquette, and skills. The androids represent the best, photoshopped version of actual families. We all aspire to create a dream family, and this story attempts to address the motives, costs, and consequences of acting upon some of our outlandish—if not entirely impossible—wishes in the world of Facebook and Instagram, where there is a constant pressure to try and make yourself (and your family) look great. Likewise, Jaroslav Veis’s “Winning Is Not Everything” addresses the competitive and inhuman world of future Olympics. The managers and owners of sports clubs and events no longer see their athletes as human beings; they are objects—bound to fail—while those serving the worst of capitalist world order exploit and profit from these inherent flaws. Even with a similar percentage of paying readers that Clarkesworld has, an online magazine in such a small market would be extremely lucky just to break even. It’s a risk no one is willing to take now, though that may change in the future if the readers’ behavior shifts significantly towards supporting their favorite projects even if they can access their contents for free. However, while pro-paying online periodicals could hardly exist in today’s Czech market, that doesn’t apply to ebooks or electronic magazines. Ebooks currently account for less than two percent of revenue on the market but their impact is growing larger every year—and I’ve already mentioned the magazine Jupiter. What’s more, those two percent apply to the book market as a whole. In science fiction publishing, the number is approaching twenty percent. Ebooks are certainly proving a viable strategy for publishers and many who refused to do them just a few years ago are now happily publishing them and would strive much harder without them. Fortunately or not, Novakova’s “zombie” analogy is an apt description of the state of the speculative fiction in non-American markets. While a possible strategy for SF writers is to go global—through successful translation projects like Dreams From Beyond—there is a danger that the rewards and prominence of SF publishing in English could sway future generations of writers to stop writing in their native tongues. The English language comes with a price tag—it’s a sign of privilege, often elitism, for non-native speakers. The time has come for the leading professional speculative magazines to encourage regular submissions from non-English authors from world languages, and collaborate with a group of willing translators to bring the best of these stories to the Anglophone world. Julie Novakova has done an excellent job with Dreams From Beyond, and I implore you to read it.